We only had a short time in Norway, between weekends in Copenhagen and Stockholm, so we opted to skip Oslo and head straight for fjord country. We took a quick flight from Copenhagen to Bergen, picked up our rental car and were at our hotel in no time. We used our Chase Sapphire points and stayed at the Augustin Hotel. It was just off the touristy area and across from Bryggen which we found perfect. It also left us a little bit closer to a more residential area (i.e., less touristy restaurants and bars!). We ended up trying a restaurant right in the Bryggen area and also one in more of the residential area. Both were good. 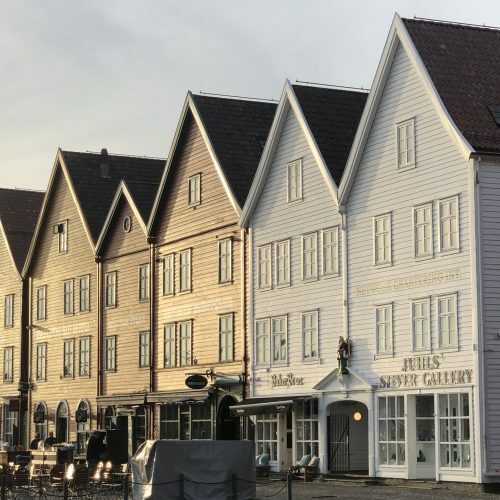 In the Bryggen neighborhood, we tried Bryggeloftet & Stuene and had some delicious seafood and meat. Lots of traditional Norwegian dishes to try here! The next night we went to Trancher Bergen after having it recommended to us by a bartender. The restaurant was cute and the food was good – but do NOT go here unless you want a steak! That’s all they do. If you do go to Trancher (or even if you don’t) make sure to stop by The Tasting Room for a cocktail – they were delicious! 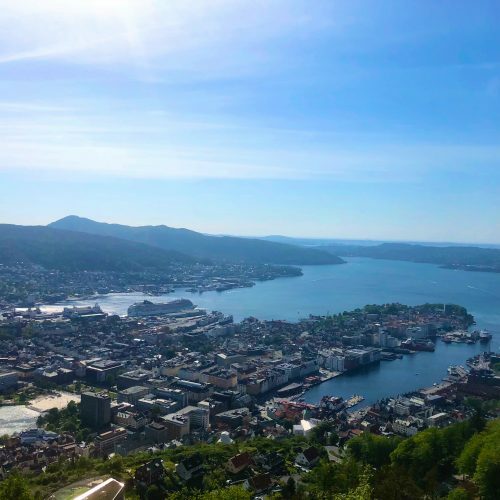 Mount Floyen – whether you opt to take the funicular or hike to the top, if you’re in Bergen you have to head to the top of Mount Floyen for some spectacular views. 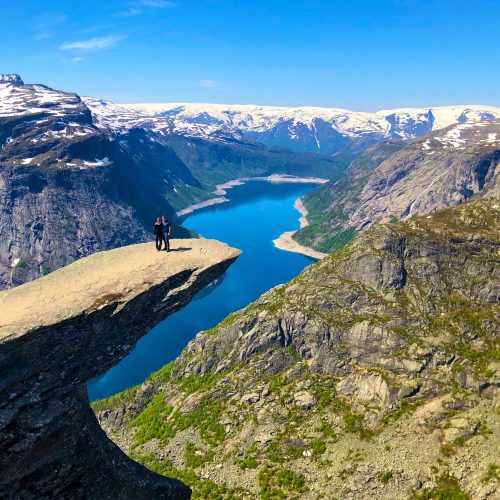 If you are thinking about hiking – do it! The hike isn’t very long and can be done all on paved roads. 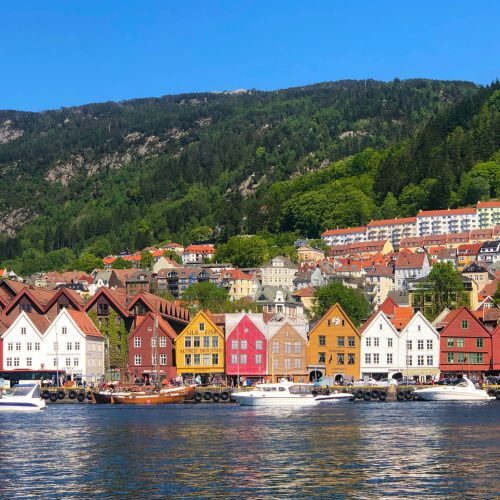 Wander around Bryggen. Mostly filled with tourist shops, it’s still an adorable section of town with plenty of places to stop for a drink or a bite to eat, especially in warmer weather. Now, Bergen was great, but that was just our jumping off point. 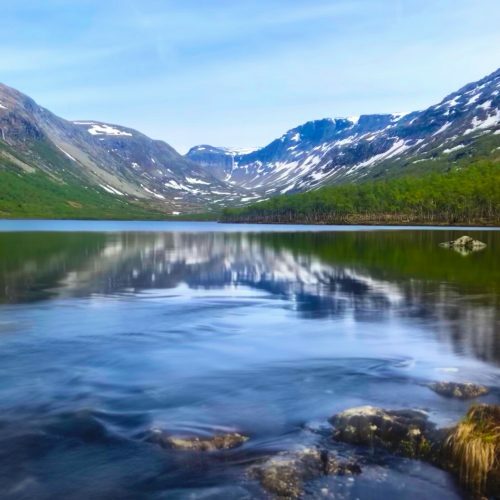 We took our rental car and took the E16 up through Voss (where we stopped for lunch) and down to Odda. 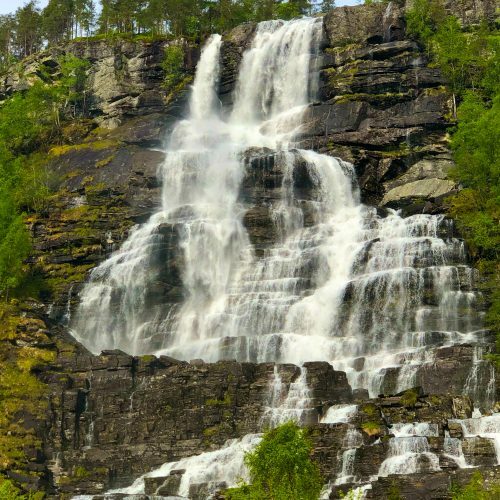 We saw endless mountains, fjords and waterfalls until we arrived Husedalen Valley and did a Four Waterfall hike – bonus, we were the only ones there! 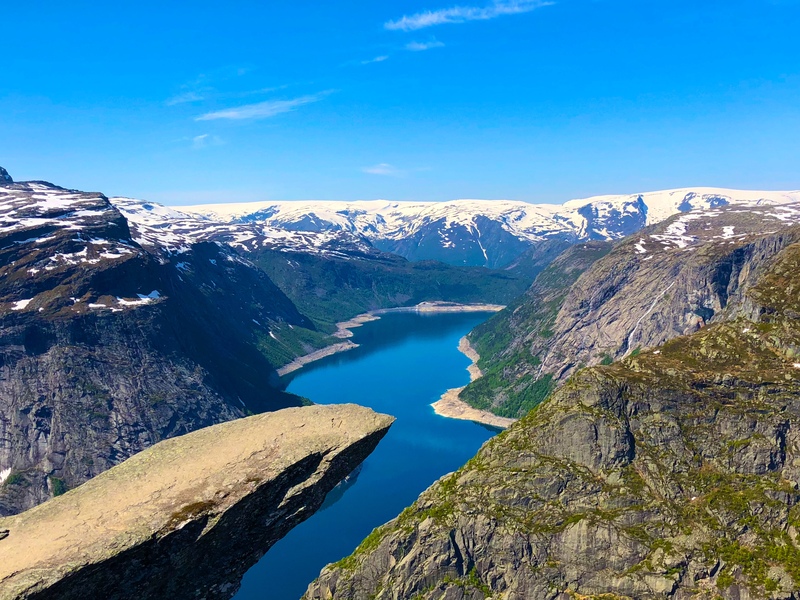 The next day we woke up bright and early and set off to hike Trolltunga, a short drive from Odda. We were hiking in late May, which can be a toss up depending on the weather and snowfall they’ve received that year, but we had gorgeous weather. There was a lot of snow melt going on so on the way back there was definitely some post holing (and lots of mud!). Stay tuned for a more in-depth post about this gorgeous hike! 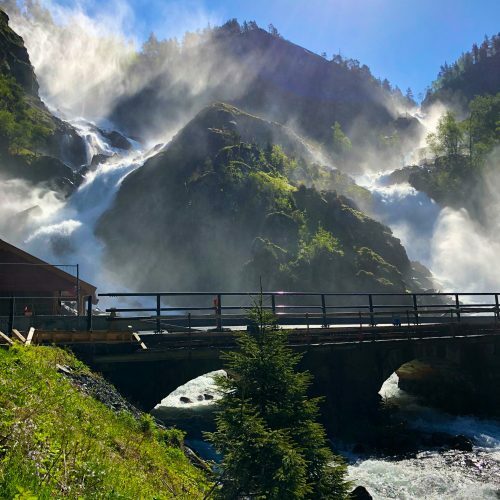 On our way back from Odda to Bergen, we went out of the way to see Latefossen – a waterfall that runs through a road! 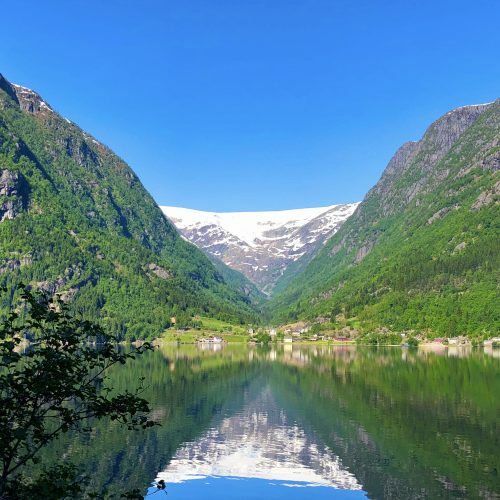 We then took a slightly more direct route back to Bergen, hopping on a ferry in Jondal to get us there – be prepared, the ferries only run about once per hour. You pay for the ferry once you’re onboard and it only takes about 20 minutes. 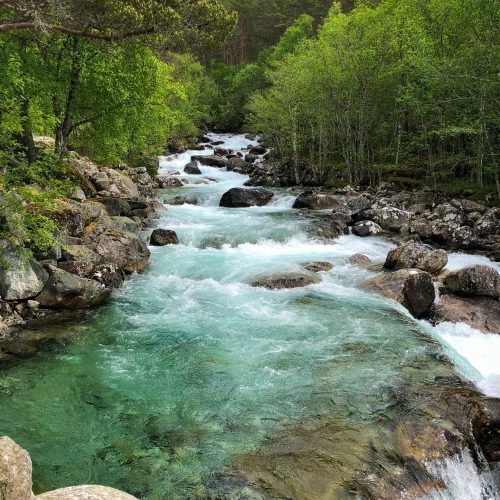 All in all, Norway was absolutely gorgeous and perfect for a few days in between two city weekends. We definitely want to go back and explore other parts of the country… one day! It’s true what they say, Norway is expensive!